This is for a bulk lot of 24 large silver wedding centerpieces, Manhattan candle lanterns from Shopatusm. 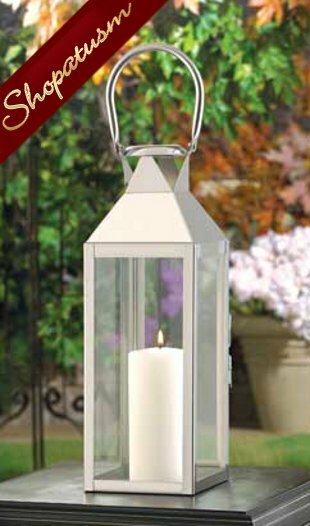 Sleek, simplified shaping and polished silvertone finish make this contemporary candle lantern into a fabulous focus piece! Place a candle inside to create a glowing work of art. Weight 3 lbs. 5 1/2 inch x 5 inch x 15 inch high; 20 inch high with hanging loop on top. Stainless steel and glass. Candle not included.